On Monday, actor Jennifer Garner received a coveted star on the Hollywood Walk of Fame, and her gratitude to friends and family was incredibly heartwarming. That Garner has great manners — what can we say? In an Instagram post, she even remembered to thank the Hollywood Chamber of Commerce. What a pro. Her caption read, "Star number 2,641: has my actual name on it! Thank you to the @hollywoodchamberofcommerce. Thank you to @bryancranston, @missjudygreer and #SteveCarell for presenting it to me with humor and heart. Thank you to my friends and family for celebrating this crazy dream of a day with me." Famous friends presented warm, humorous speeches about Garner as her parents and three children (shared with ex Ben Affleck, not present) beamed proudly. 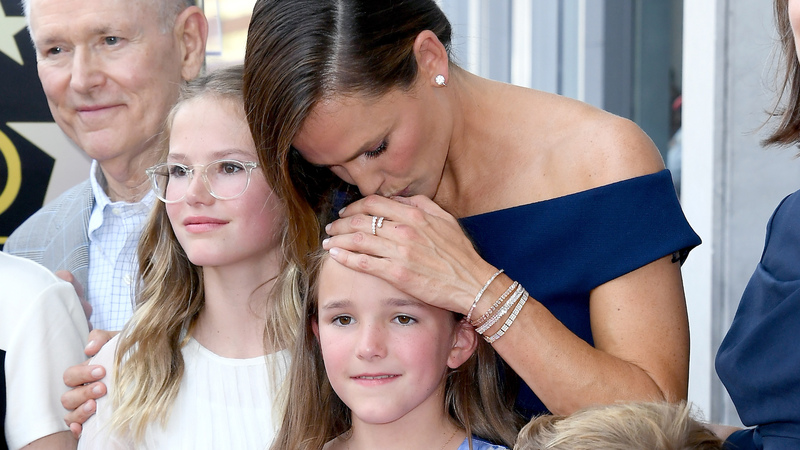 Garner took the podium to address the crowd after the accolades and immediately turned to her beloved family — Violet, 12, Seraphina, 9, and Samuel, 6 — with emotional words meant just for them. https://www.etonline.com/jennifer-garner-chokes-up-with-emotional-message-for-her-kids-while-receiving-star-on-the-walk-of"All of you here are the most special people in the world to me," a clearly choked-up Garner said as she addressed her family. "Violet, Sera and Sam. Hi, buddy! And my parents and my sisters, my nieces and my nephews." She continued, "For my children, when you walk over this star, I want you to remember first of all that I love you. And that this is about hard work and good luck and not a whole lot else. You define me, not this wonderful spot on the pavement." Garner quipped, "Also, for the record, don’t spend too much time on Hollywood Boulevard." Garner spoke with ET after the Walk of Fame ceremony. "I’m so overwhelmed by what an enormous production this ceremony is," she said. "Having Steve Carell and Bryan Cranston and Judy Greer here to speak about me, and the thought they put into what they were going to say, and how funny and charming, how much I adore them. And also for me, I’m seeing I have this whole group of people here that I've worked with for decades and friends from forever. So it is a very, very special honor." When it comes down to it, Garner — a West Virginia native — is a country girl at heart. She recently spoke to Southern Living about her decidedly non-Hollywood values and what she wants her kids to know. More: Is This the Real Reason Jennifer Garner Hasn't Officially Divorced Ben Affleck Yet? Garner's grace under pressure continues to impress and amaze us. The same day she received her star, Garner's ex, Affleck, was making headlines in gossip columns about a possible breakup from girlfriend Lindsay Shookus. Affleck who? Shine on, Jennifer Garner. We're on your team.